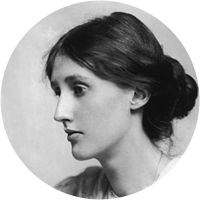 A collection of the best Virginia Woolf quotations. Language is wine upon his lips. Literature is the record of our discontent. I ransack public libraries & find them full of sunk treasure. It is the privilege of loneliness; in privacy one may do as one chooses. Her mind is a very thin soil, laid an inch or two above very barren rock. The poet gives us his essence, but prose takes the mold of the body and mind entire. Wherever one cut him, with a little question, he poured, spurted fountains of ideas. I don't believe in aging. I believe in forever altering one's aspect to the sun. Hence my optimism. One has to secrete a jelly in which to slip quotations down people's throats—and one always secretes too much jelly. A biography is considered complete if it merely accounts for six or seven selves, whereas a person may well have as many thousand. A masterpiece is...something said once and for all, stated, finished, so that it's there complete in the mind, if only at the back. Travel and idle, contemplate the future or the past of the world, dream over books and loiter at street corners, and let the line of thought dip deep into the stream. There can be no two opinions as to what a highbrow is. He is the man or woman of thoroughbred intelligence who rides his mind at a gallop across country in pursuit of an idea. Vague as all good definitions are, a good essay must have this permanent quality about it; it must draw its curtain round us, but it must be a curtain that shuts us in, not out. If we didn't live venturously, plucking the wild goat by the beard, and trembling over precipices, we should never be depressed, I've no doubt, but already should be faded, fatalistic and aged. Almost any biographer, if he respects facts, can give us much more than another fact to add to our collection. He can give us the creative fact; the fertile fact; the fact that suggests and endears. A poor wretch of an author keeps all his thoughts in a dark attic in his own brain, and when they come out in print they look so shivering and naked. So for other people to like them is a great encouragement. Considering how common illness is, how tremendous the spiritual change that it brings . . . it becomes strange indeed that illness has not taken its place with love and battle and jealousy among the prime themes in literature. Books are everywhere; and always the same sense of adventure fills us. Second-hand books are wild books, homeless books; they have come together in vast flocks of variegated feather, and have a charm which the domesticated volumes of the library lack. The intellect, divine as it is, and all worshipful, has a habit of lodging in the most seedy of carcasses, and often, alas, acts the cannibal among the other faculties so that often, where the Mind is biggest, the Heart, the Senses, Magnanimity, Charity, Tolerance, Kindliness, and the rest of them scarcely have room to breathe.